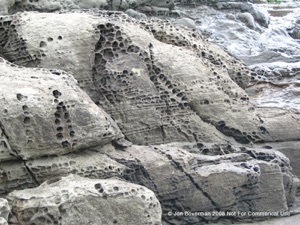 What Rock Types Do Tafoni Prefer? Rock Types. Though described in a wide range of rock types such as gneiss, schist, basalt, granodiorite, andesite, eolianite, argillite, porphyry, tuff, conglomerate, lava, and limestone, tafoni are most prevalent on granite, greywacke, and sandstone (Mellor, Short, & Kirkby, 1997; Mustoe, 1982) and rocks particularly susceptible to spalling and granular disintegration (Blackwelder, 1928; Dragovich, 1967; Pye and Mottershead, 1995). 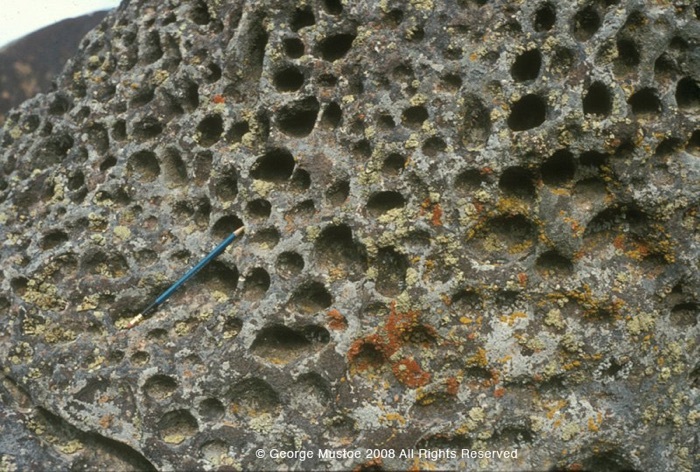 Tafoni are reported on most often on medium to coarse-grained, granular, silicate rocks like granite, granodiorite, gneiss, and sandstone (Smith, 1978; Conca and Rossman, 1985; Mellor, Short, & Kirkby, 1997; and Hejl, 2005). Idaho basalt, Starvation Rocks State Park. Structural Controls. 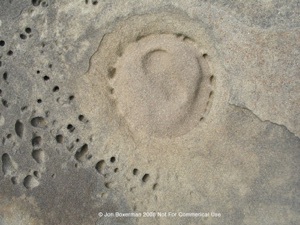 There are many examples of tafoni forming in jointed and bedded rocks and some instances of tafoni forming in rocks with well-developed turbidite features. Mustoe (1971) found that “alveolization patterns strongly reflect bedding structure”, in one of the earliest accounts connecting lithologic variation and tafoni structure. 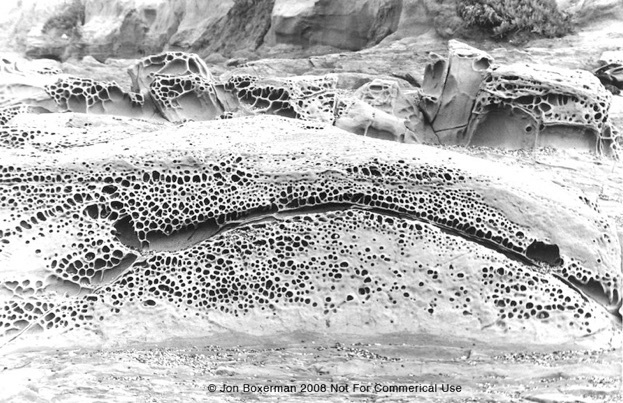 Martini (1978) concluded that minor structural variations like small fractures may control where tafoni initiate. 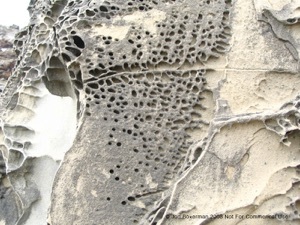 Tafoni often develop in areas of high permeability like along a contact between lithologic layers of differing permeability. 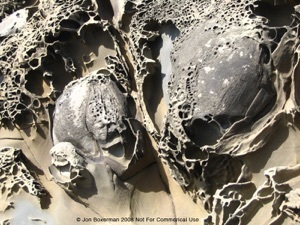 Consider in the images below tafoni regularly forming around concretions and along bedding planes. It is clear that the internal rock makeup, at structural and lithologic levels, plays a major role in determining where tafoni will propagate.